We recently helped a young couple with a new baby remodel and decorate their dated bath/laundry area so that they could enjoy comfort, functionality and style for many years to come. 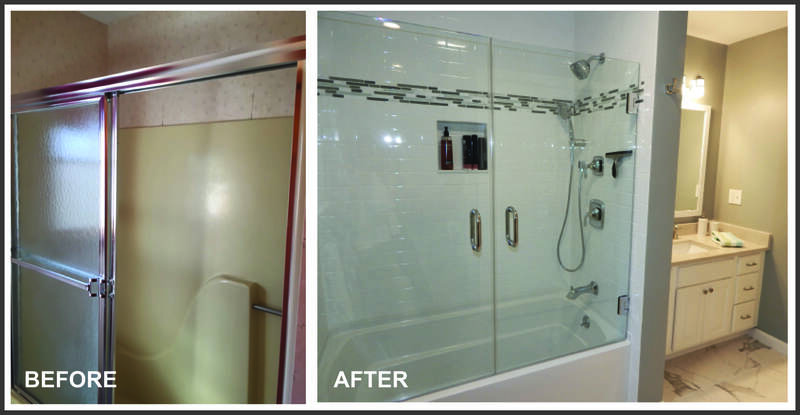 If you are considering a bathroom remodel, we hope our before and after photos below provide inspiration for creating your dream bathroom – please contact us if you need our help! White vanities, quartz countertops and carrara marble continue to be on trend. We gave this dated bathroom a stylish update with faux carrara marble flooring (that wouldn’t break the budget), bright white paint for vanity, molding and trim, and a soft neutral gray wall color. The quartz countertop, polished chrome faucets and hardware, framed whited mirror and vanity lighting completed the design our client had envisioned. Finding the right shower design that would be perfect for bathing a baby was a small challenge. We started from scratch with a new porcelain tub, white subway tile and glass tile accent enclosure, shelf insert for storage, and a single handle chrome shower head and faucet. The frameless french glass shower doors not only adds style but allows great functionality when bathing a child. 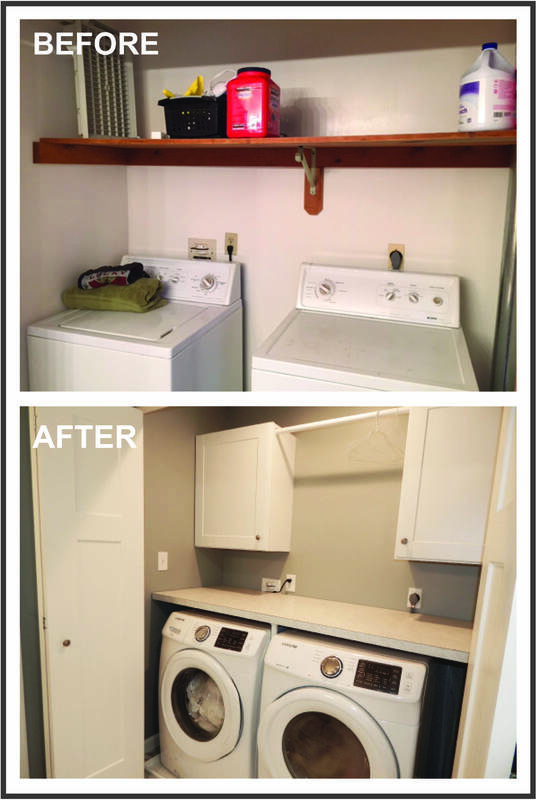 This laundry closet transformation was top on our client’s list. She needed easier access, a place for storage and folding clothes, as well as a way to hang wet clothes with ease. We created a more functional space including new front load washer and dryer, new cabinets and hanging bar, a formica countertop, and new mission style closet doors. We also provided some extra space by moving the wall back. The kitchen featured below was our favorite renovation of 2014. We love the classic white kitchen cabinets combined with modern elements including industrial style pendants, a floating hood and natural stone backsplash, and most of all the Quartz island and countertops. 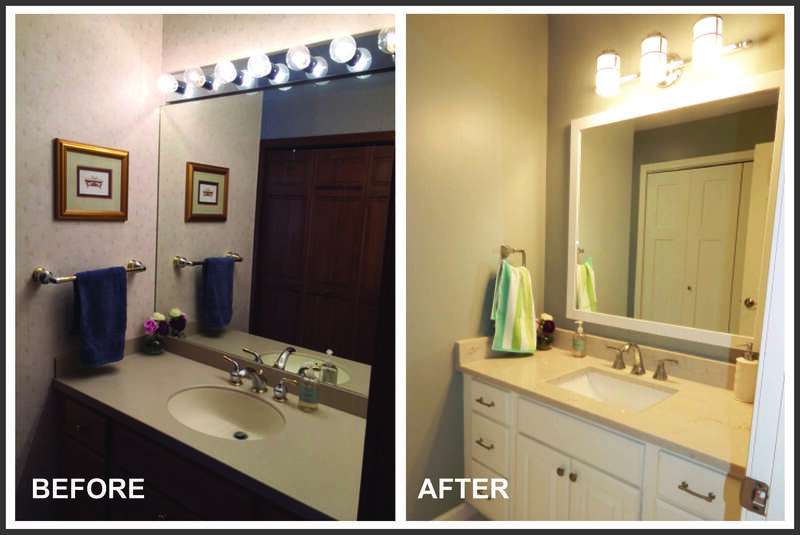 This South Salem, NY bathroom was transformed once we decided to give it a modern facelift by painting the dated vanity a dark espresso and adding stylish cabinet hardware. The transformation offers buyers a move-in ready master retreat. 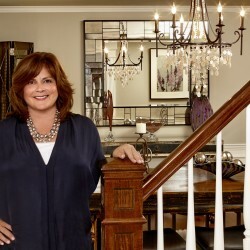 Patti’s 1969 master bath was cramped and outdated so she decided to demolish the space to provide a blank canvas for a new layout and design. The new and improved room features a modern, spa-like style with an earthy color scheme including a rich espresso vanity, glass tiles, a stone shower floor, frameless shower door, and jeweled light sconces affixed to the wall-to-wall mirror. This vacant 1930s mansion in the historic district of Hartford, CT was transformed into a property designed to engage buyers. Using modern elements and warm colors our staging team created a modern decor that showcased the wonderful architectural detail of this unique home. The decor in this multi-million dollar, 5,700 square foot colonial in Westchester, NY living room was outdated and the furniture layout was uninviting. After we rearranged the furniture, refreshed with a modern wall color, and updated the room’s accessories including a more modern rug, this room appealed to buyers both online and in person. For more information and to view more photos of our interior decorating and staging projects, please visit our portfolio page at www.pjstagingdecorating.com.